Pennridge Rowing for the Rams? “Exhilarating, brutal, and empowering” is the way Pennridge English teacher and prior rower at Bucknell University, Mr. Crooke, chose to describe the sport of rowing. Rowing is a unique, yet fast growing sport across the country. 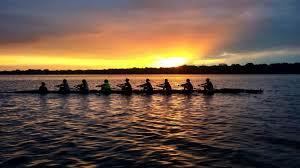 It offers many opportunities for individuals who wish to continue rowing at the collegiate level. Unfortunately, rowing is not offered at Pennridge High School. Pennridge High School currently offers its students opportunities to participate in a variety of clubs as well as varsity sport programs. Assistant Principal, Mr. Hegen, explained that he had not given much thought to adding rowing to the high school’s extracurricular activities. “However, I’m down for anything to increase student involvement,” he said. Mr. Hegen stated that the introduction of rowing must first begin as a club before being recognized as a sport. He described the involved process that one must go through to propose a new club. Introducing rowing as a new club would require approval by the club faculty advisor, Mr. Ott. There must be an available facility, a supervisor, and enough interest by the school body. Lake Nockamixon is located only ten minutes from Pennridge High School. For only $25.00, a license can be purchased to allow practices to be held on the water. Any workouts that do not require water could be held at the high school’s gym, weight room, and track. “Adding a rowing team to Pennridge would be unique. It would set us apart from other schools” Mr. Crooke commented. Rowing for the Rams could be a possibility in the near future.